All non-member rentals shall be $700.00. A $300.00 security deposit is required at the time of booking. (Trustee Jocko Veillette is the contact person for ALL hall rentals). 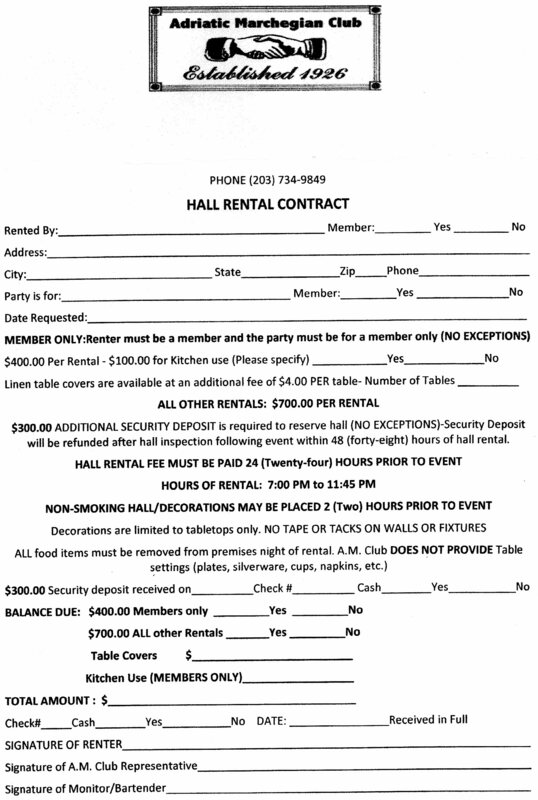 All member rentals shall be $400.00 & Kitchen rental is an additional $100.00 on the day of the event. Members are not required to leave a security deposit, but most adhere to the same kitchen clean up procedures. Members are allowed to use the hall & kitchen at no charge for a funeral re-pass. Members usage of the hall is limited to immediate family, i.e., Spouse, Mother, Father, Son, Daughter, or Significant Other. All Fundraisers will be $500.00 with kitchen rental an additional $200.00. The member rental rate of hall and kitchen will apply only if a Stag is for a club member only. NO exceptions. Kitchen floors must be mopped, table tops sanitized, no dirty pots /pans left in sink. All leftover food & garbage is to be removed from kitchen & hall after rental party is completed. Failure to follow these procedures will result in the loss of the $100.00 security deposit. Any rental parties may use an outsourced caterer, but caterer must use A.M. Club kitchen personnel for kitchen and hall clean up after the rental. (All rental prices include hall monitor and/or bartender cost and set up/break down of tables and chairs). All rental parties will be responsible for removing all food from premise, clean up of tables and leaving of the hall & kitchen in an orderly fashion. Damage to hall or other club property caused by persons attending the rental event, will result in a forfeiture of said security deposit. All rental parties will be held responsible for their guests’ actions on club property and must conduct themselves accordingly. 4. Notice to Quit Premises No Later Than 11:45 P.M.